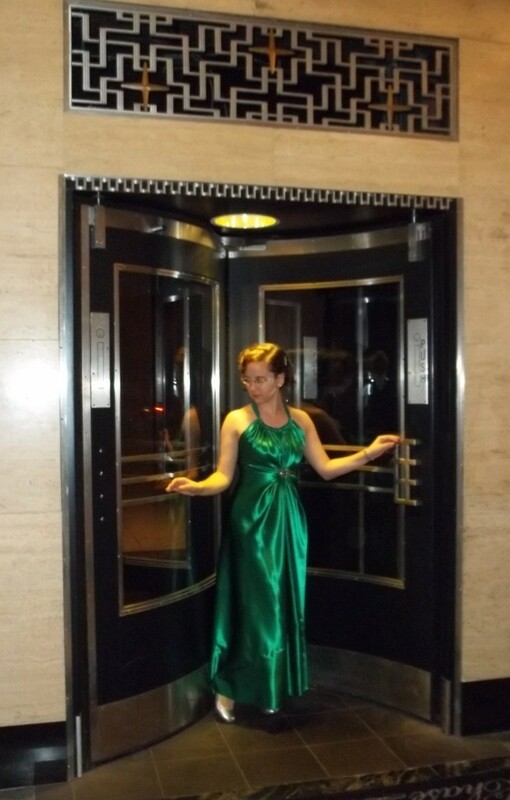 In response to Nikki’s comment and to clarify what I didn’t address in my latest post, here is a follow up which will explain the closure system to my Vionnet evening gown and how the buckle works. Working with vintage parts can be rather tricky because they are slightly different than what we are used to with modern notions and sewing parts, but with some ingenuity they can be made to work in more than one way. 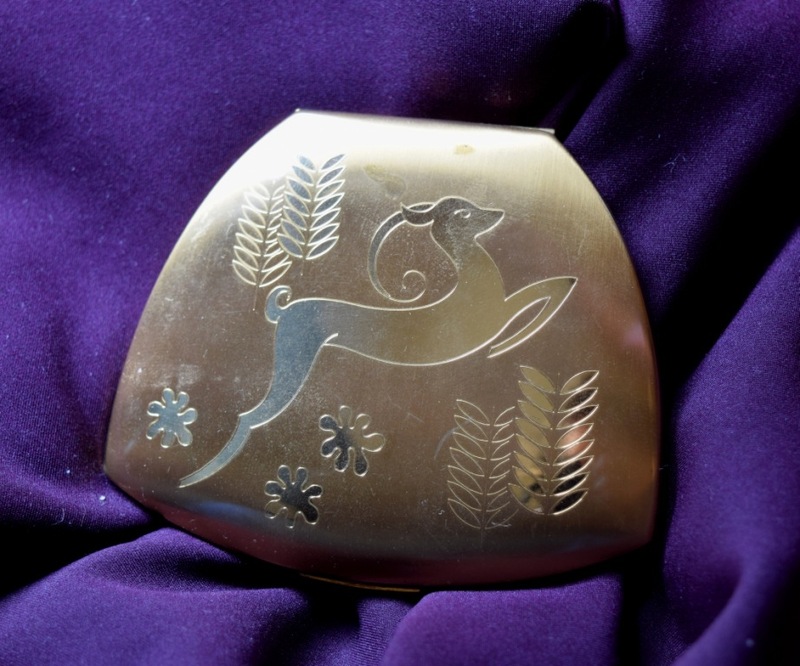 This buckle is no exception. The back had a very odd and basic bar to the back of each half, like it was made for the ends of a belt to be looped around. The hook closure is a simple metal piece bent over to loop into an opening of the other side detail work. I have several other 1930’s buckles and they have these same features. 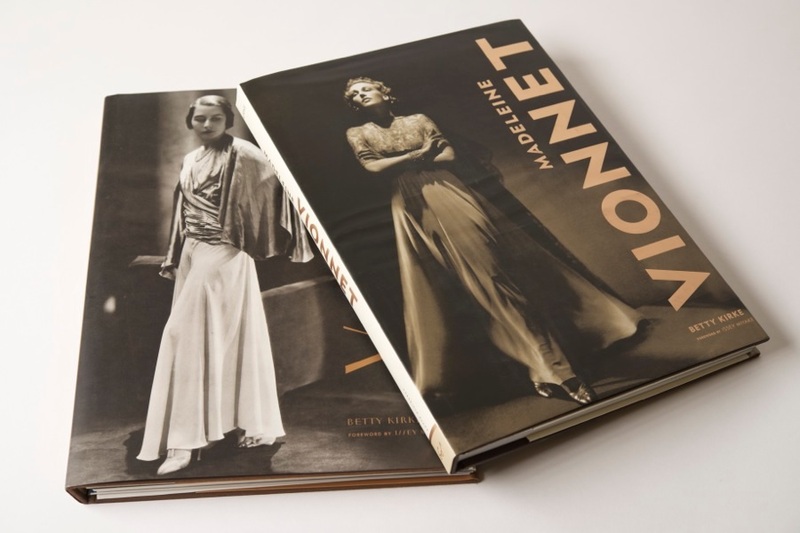 Now, Vionnet original plan for this dress call’s for a square decorative piece (look at the pattern piece), not even a buckle. Her original dress has four eyelet openings so that hooks in the decorative piece can loop in the openings and bring the dress in that way. 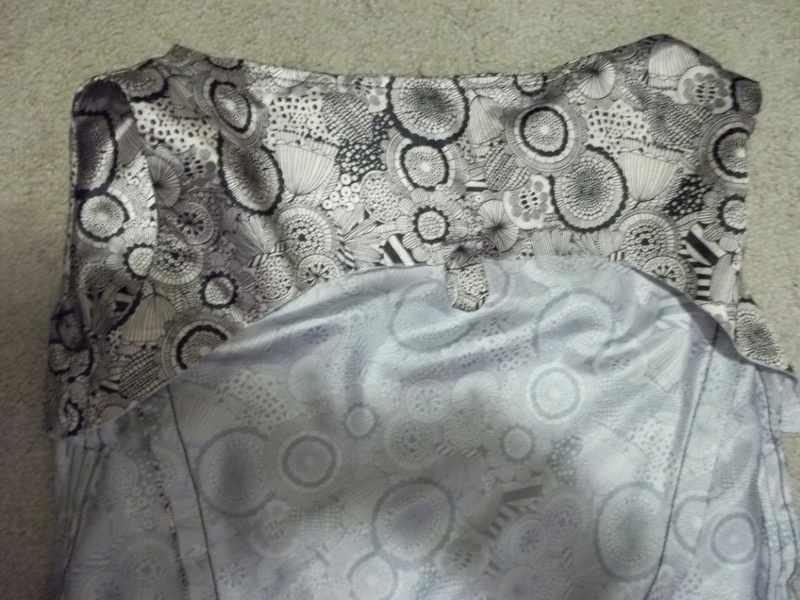 Since I was working with an actual buckle, I attached the backer bars behind each side to fixed spots on my dress. 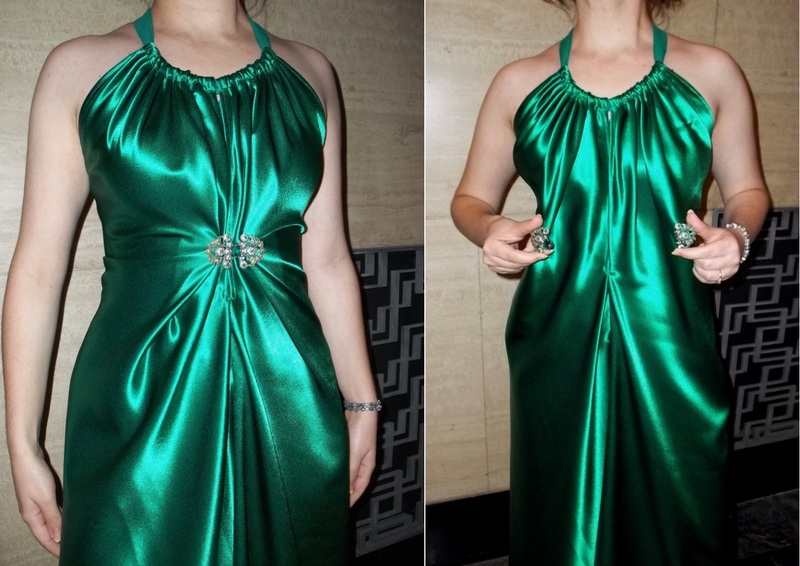 This was a bit challenging…I had the measure the space between the two bars when the buckle was closed and figure that in when I was estimating where to attach the closures and how tight to bring in the dress. 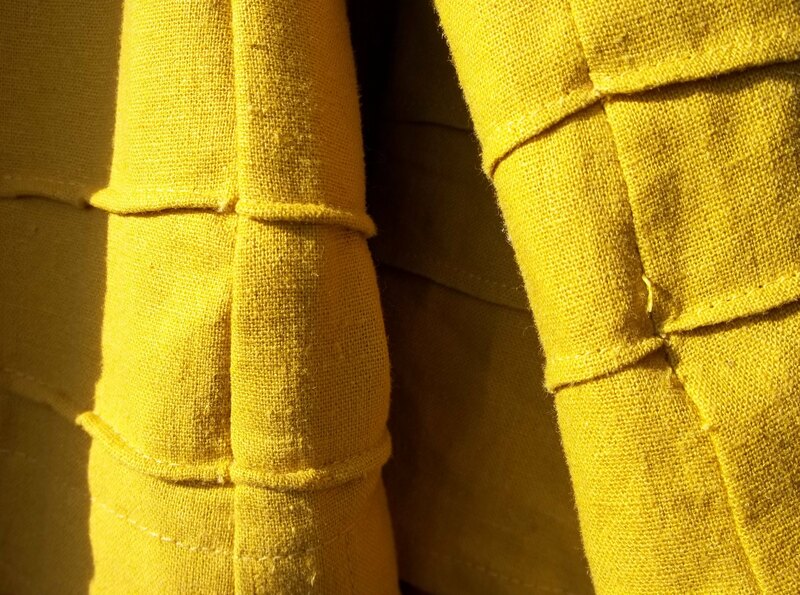 At first, I merely whip-stitched the backer bars around and around directly to my dress, flat on top with no pleat or anything, at a spot of my choosing. 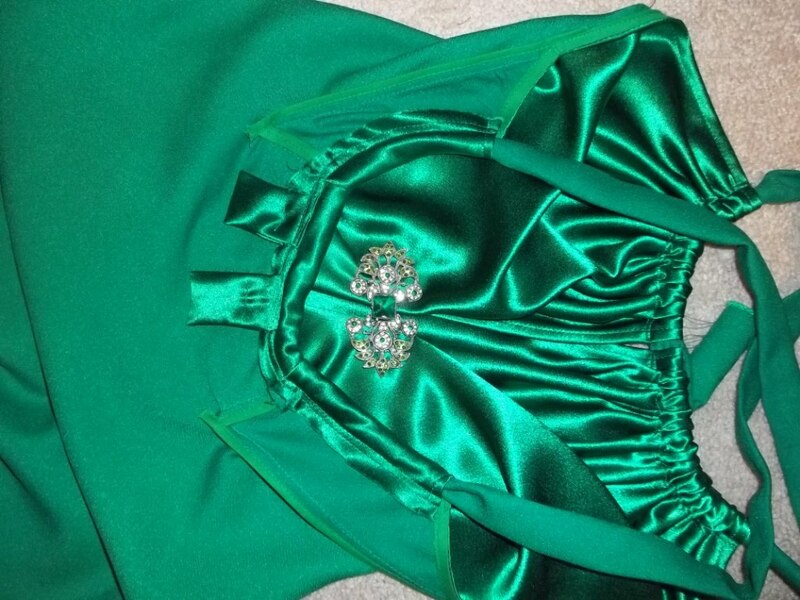 The fabric of the front just folds in and gathers on its own under the buckle when the dress gets clasps. After a night of partying and dancing, however, the threads around the buckle back broke and I had to come up with something which gave the fabric more support. Plan two was to still sew the buckle on in the same spot in the same way but I used a small cut of some green felt, double layered, to back the buckle inside the wrong side. This works great and feels quite stable as well as not ripping out the stitches and/or fabric. 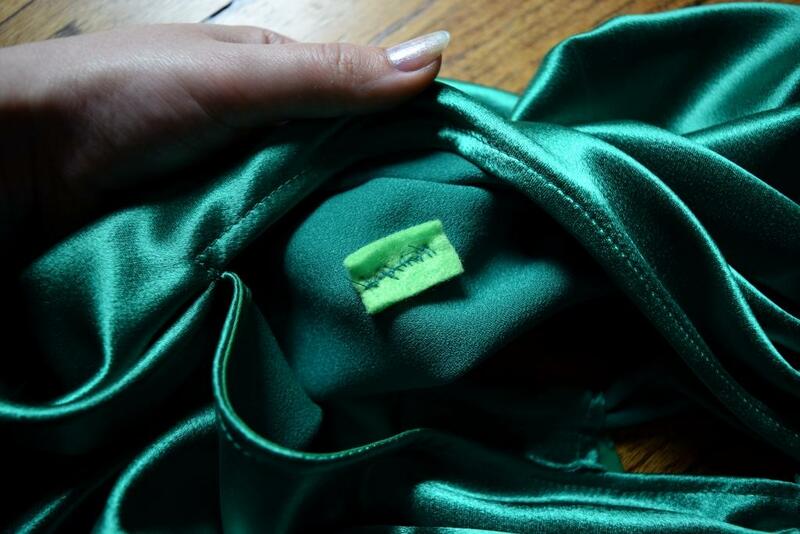 The felt inside acts like a cushion for the thread to wrap tightly around (although it looks like surgery stitches), and provides a wide anchor spot to strongly bring the dress in with no appearance of even pulling at the fabric. 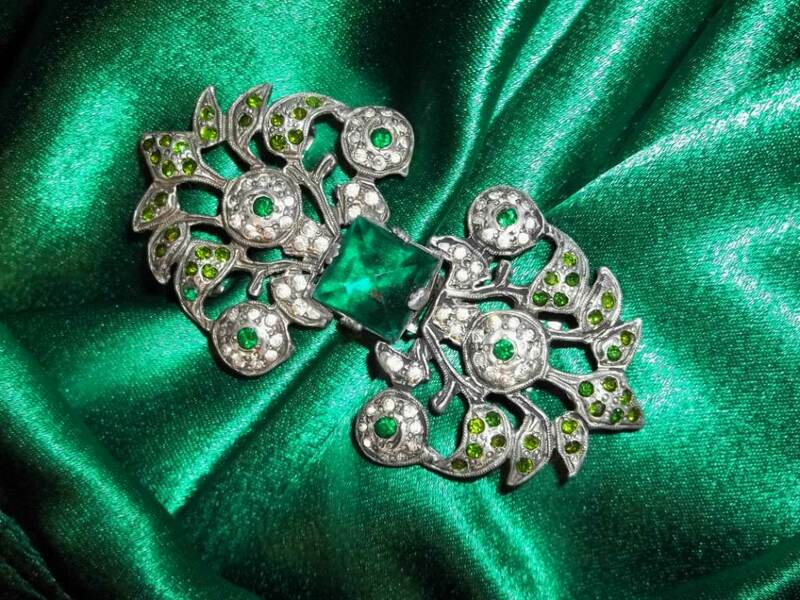 I hope this post clarifies any confusion as to how to use those vintage buckles you see or find and also how my emerald Vionnet dress closes. There are plenty of awesome vintage notions out there – go find that ‘perfect’ project to make them have a new life at the hands of your creativity. A little voice in the back of my head wants to “save” stuff like this…but no! Vintage pieces can really help a project shine, elevating it from special to extra-special! They might need some t.l.c., or some extra effort but it’s worth it. Have you worked a really neat vintage notion into a sewing project or had to get creative with it? Did this post help you? In the history of America, the thirteen years (1920 to 1933) during which citizens were meant to go dry from alcoholic liquids unintentionally became a time for much of the opposite to sobriety. The era of the “flapper-and-gangster” cocktail drinking crowd was born, and flagrant law-breaking lived alongside the sober and those that loved fun times. 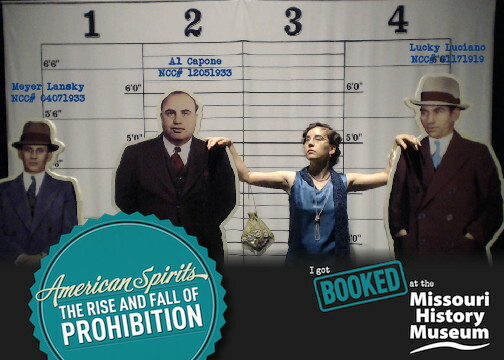 I’ve always loved the history of the 1920’s and 30’s, but recently learned a whole lot more about what was going on in those eras thanks to the exhibit “American Spirits: The Rise and Fall of Prohibition”, from the National Constitution Center. The engrossing exhibit came to our town’s History museum for a number of months, and I visited several times, wanting to go more just to soak in all the info. To close the last week of the “American Spirits” exhibit, our History museum put on a “Speakeasy” party, which happened to fall on a special day for me -my birthday. I had to attend, and go all out I did! 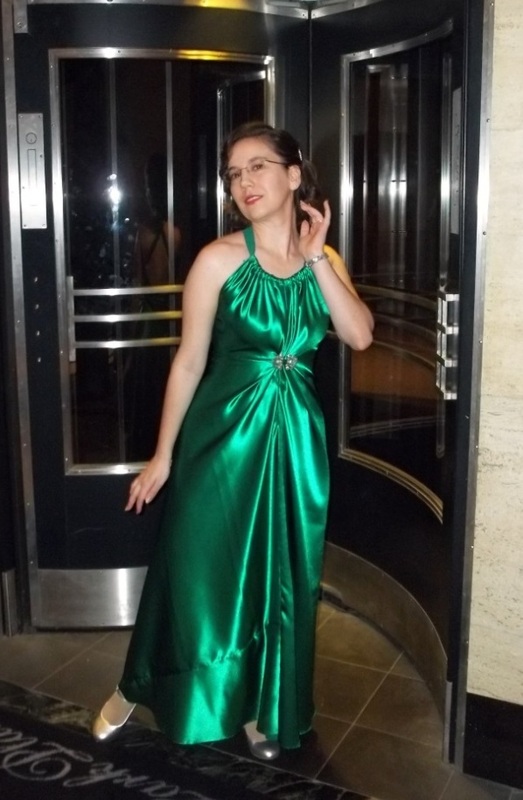 Behold my official, mid-1920’s satin evening party dress! FABRIC: My fabric is a semi-dull satin, with a pearlized swirl-type of buff finish across the fabric in random places. The hammered finish on the satin gives it a sort of “ice cold” beauty. It is in a deep turquoise color, and unfortunately, the fiber content is 100% polyester. 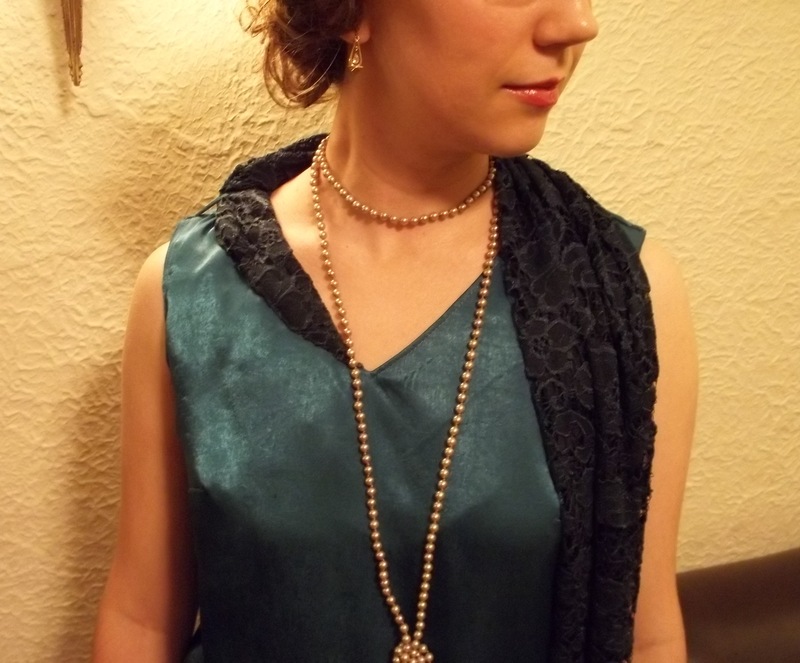 The lace neck shawl is made from a deep forest green stretch lace. 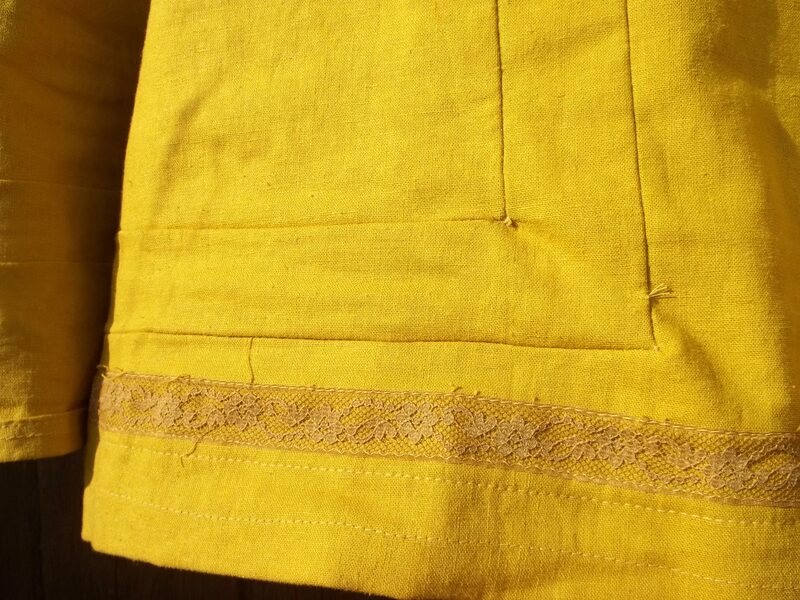 This lace has 1/3 of the flowers as shiny and satiny, but all the flowers are raised in an embossed-style. Both fabrics are from Hancock Fabrics. NOTIONS: Everything needed was on hand already. 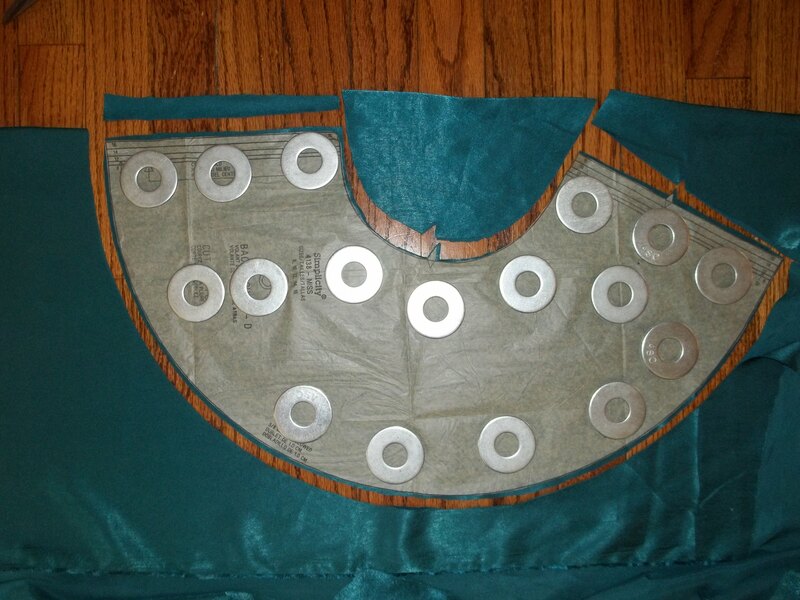 I had the right color thread (I seem to do so much sewing in turquoise) and lightweight interfacing. The gold buttons to bring in the dress at the hips were bought on a deep sale a few months before my Prohibition dress was made. 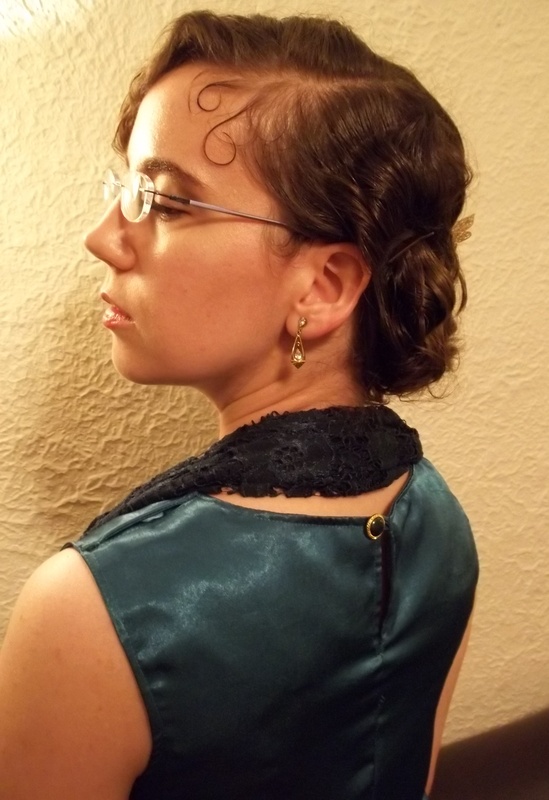 The deep green and gold back neck closure button came from my hubby’s Grandmother’s stash. (See left picture, to see my detailed photo of the back button and my little spit curls which I stuck down to my skin with hair goop! 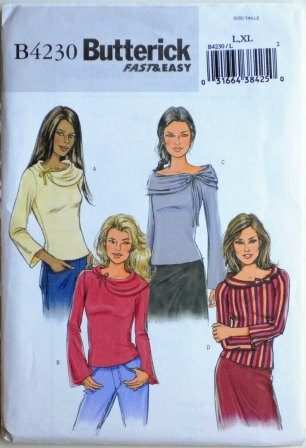 PATTERNS: My good old standby pattern for making a basic 20’s shift was used again here – Butterick 6140, year 2004 (at left). 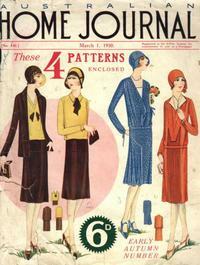 This pattern was previously used to make my “Geometric Lines” 20’s tunic. 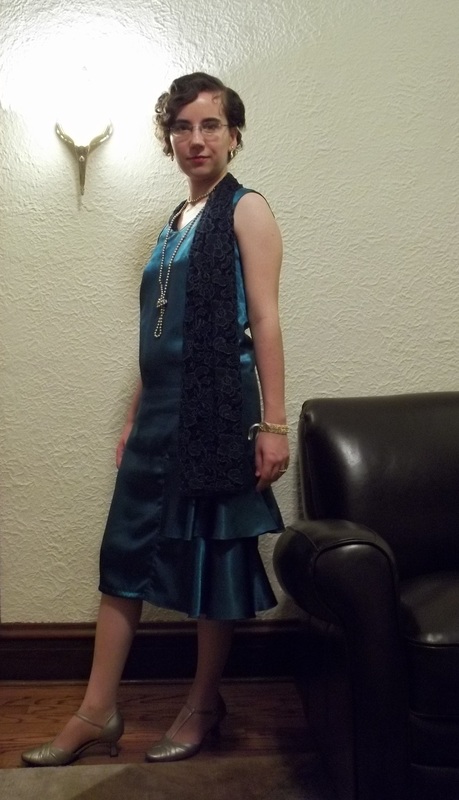 For my Prohibition dress, I made view G, with the V-neck and the mid-length, except the sleeves were omitted. 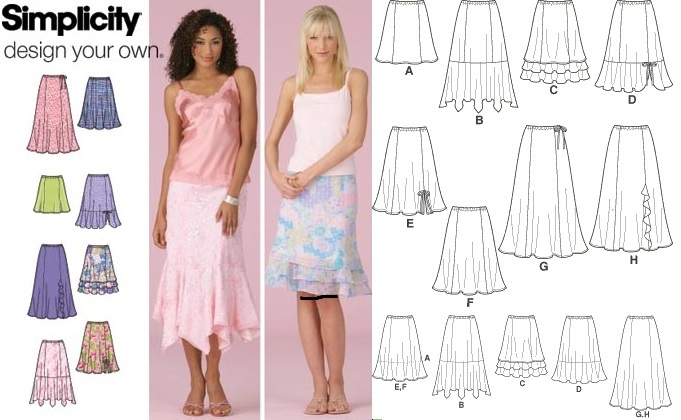 Simplicity 4138 pattern (at right), skirt bottom piece of view D, was used to make the two bias flounces for the side of my dress. 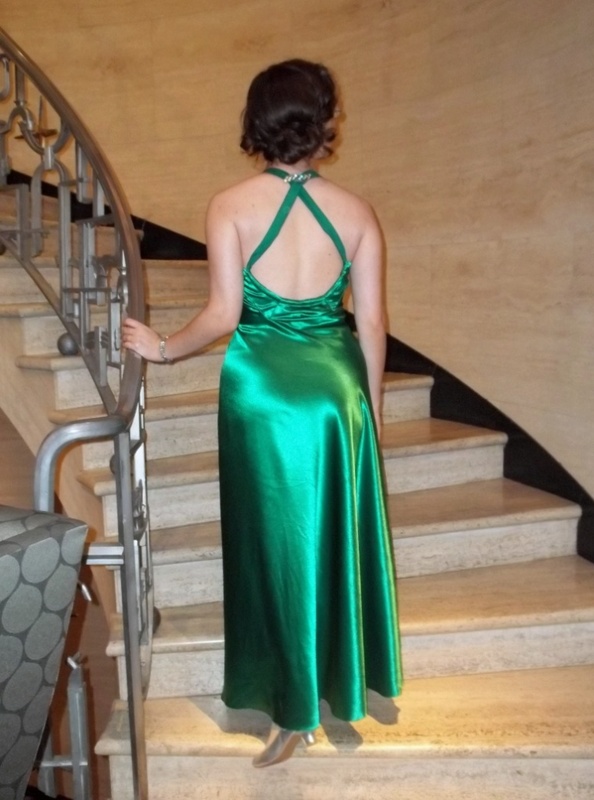 TIME TO COMPLETE: In total, my dress took only 6 to 8 hours to make, and it was finished on August 8, 2014. THE INSIDES: Couture touches are everywhere on this dress’ inside. 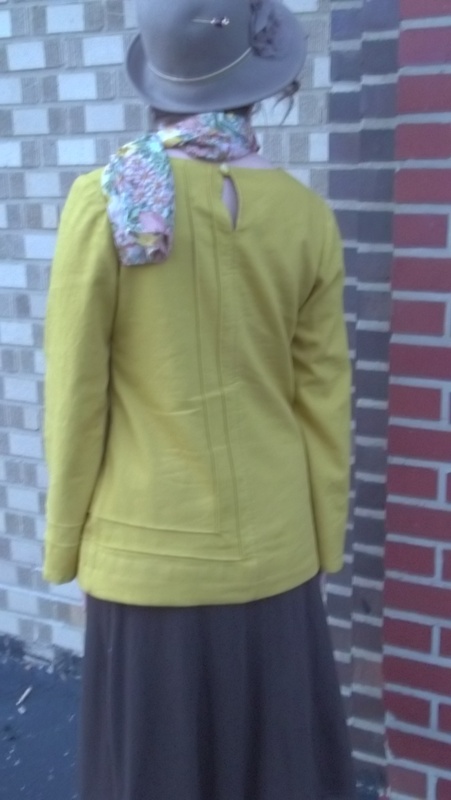 The entire neckline, shoulder, and armhole openings are covered by a giant one pieced facing which was tricky to sew in, but very nice once finished. 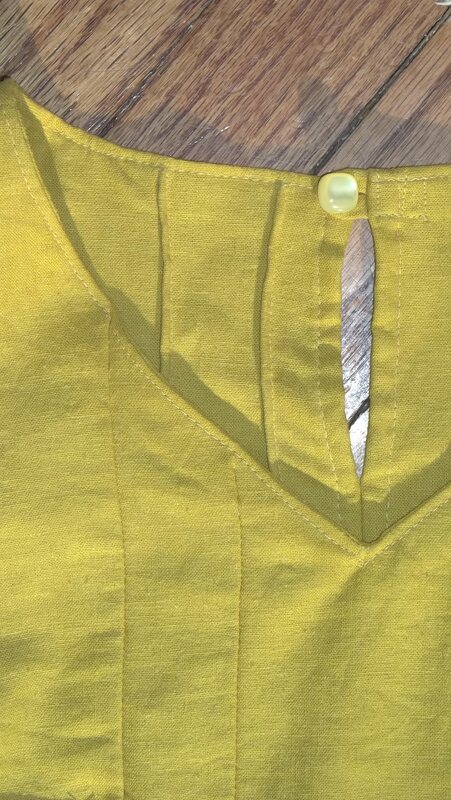 My dress’ side seams are French seams, the bottom hem of both the flounces are done in tiny, time-consuming 1/8 inch hems. TOTAL COST: This was an unexpected project, and the materials were a bit more pricy because I wanted something with fine quality and historical accuracy to match with the idea in mind of how I wanted my final creation to turn out. Everything was on sale, but, even still, I believe the total cost to be no more than $27.00. 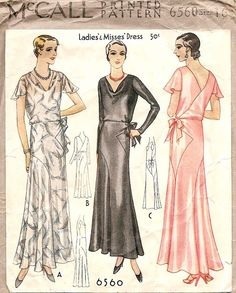 This is pretty reasonable, I think, especially since it’s nice as an all-year-round fancy party dress – not just for drinking liquor on the sly “a la 1920’s”! 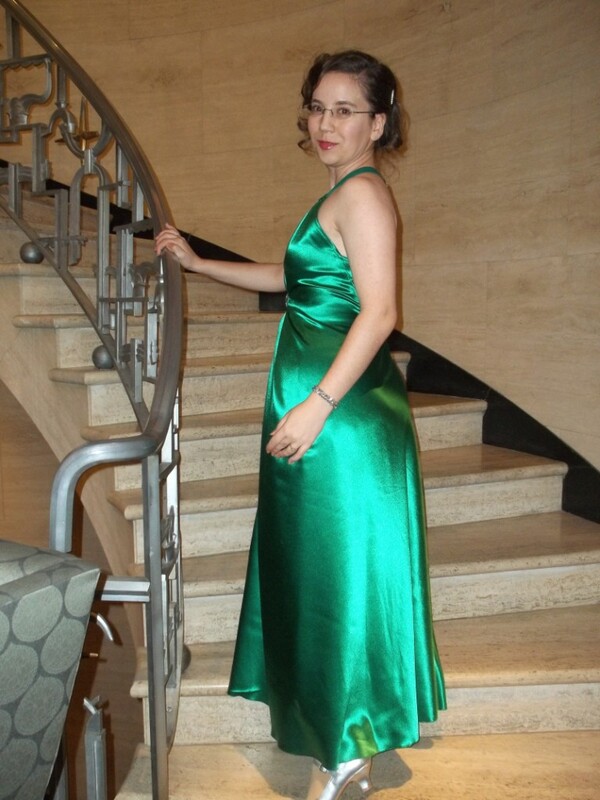 This dress was the product of much research and inspiration. 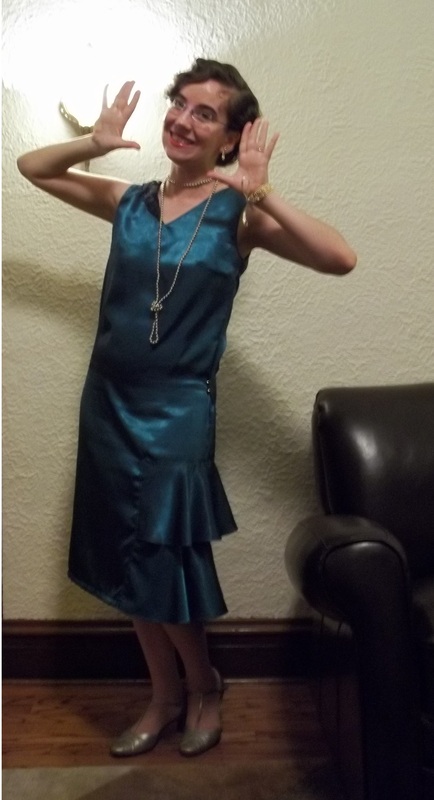 My dress’ style of satin has the look and feel of what was popular as a dressy fabric for the 20’s, excepting the fact that it is not a silk like what would have been used back then. 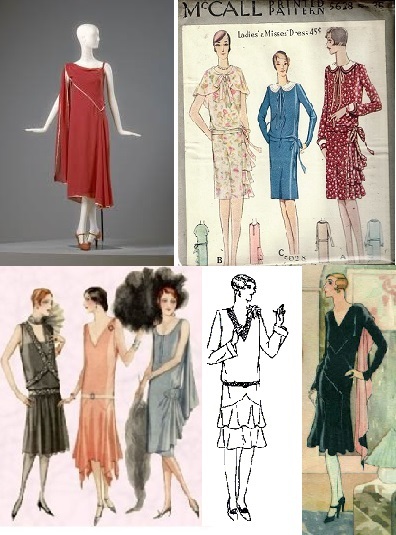 I have always loved the popular asymmetric styled dresses of the 20’s and 30’s, so making something with that design was definitely in mind for my speakeasy dress. In the end, I took a little bit of everything that I liked, and everything which seemed to fit in for the dress, both appearance wise and from the standpoint of a fashion historian. Here at right is a collage of all my inspiration pictures which explain and justify the authenticity of my Prohibition dress. 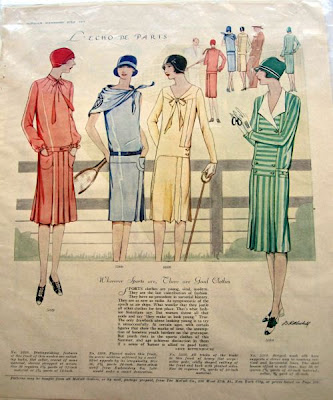 Starting from the top left and going clockwise: a 1922 silk crepe dress by Madeleine Vionnet (Arizona Costume Institute); the cover envelope of a late 20’s printed McCall pattern #5628; a bias seamed (Vionnet-style) dress from a French fashion catalog; a “mid-20’s slip on dress” #925 reprinted and sold by Past Patterns; and finally, another fashion image from the late 20’s (’27 or ’28). As you can see, my five different inspiration sources are dating between 1922 to 1928. However, the main features of my dress, especially the way it poufs out above where it hugs my hips, is a tell-tale shape which would constitute calling my dress a mid- to late-20’s creation. 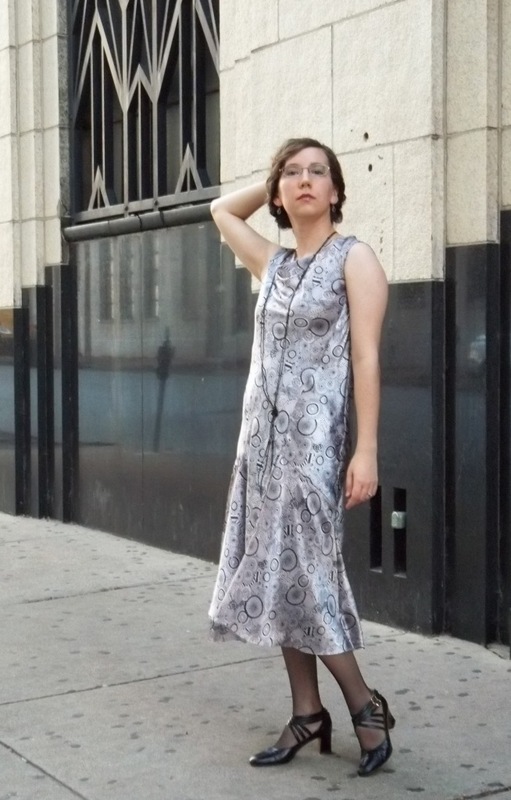 Thus, I can confidently say that my dress is historically accurate, with the exception of the fabric content, while staying true to my own personal style and taste. To me, finding such a perfect combination is a match made in heaven. It’s like finding a little bit of yourself in a historical time past…the true greatness of sewing your own vintage wear. 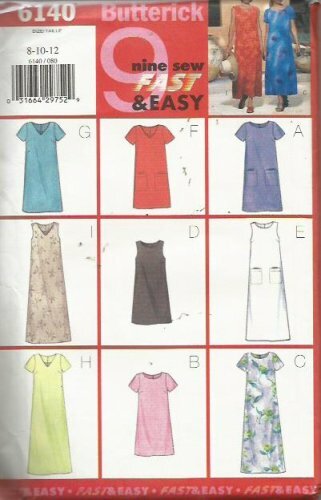 The basic dress was easily and rather quickly made according Butterick 6140. Just like when I made it the first time, going down a size from what the chart (on the pattern envelope) shows gave me a perfect fit. In other words, Butterick 6140 runs generously. Once compensating for the sizing, it has wonderful proportions for smaller women who don’t have too drastic bust-waist-hip measurements. Also, when doing the upper inside facings, it is important to follow the directions on the instruction sheet – they might seem a bit strange and complicated, at first. 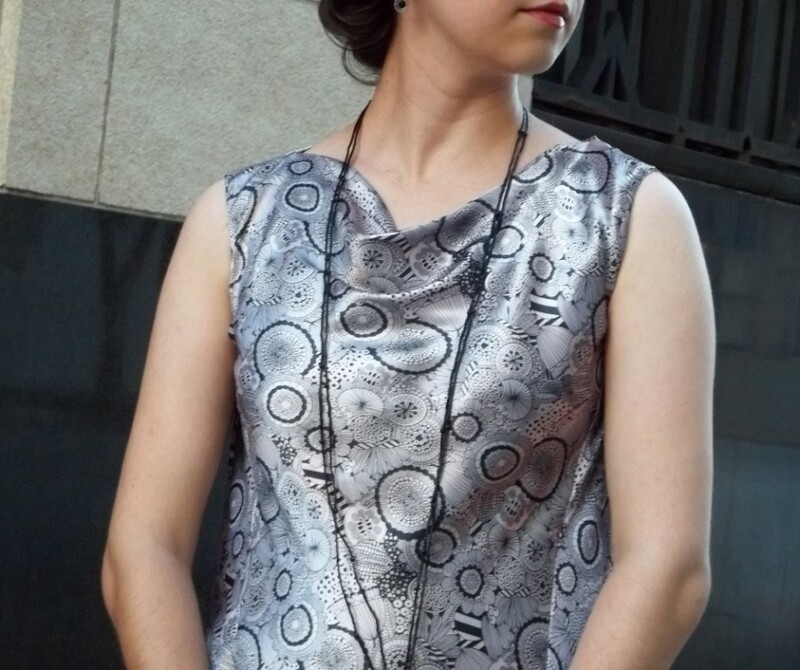 However, as long as I followed through, Butterick 6140’s facings turned out great, despite being a bit time consuming. The method for putting in the facing is really pretty smart, too. It not only makes for a beautifully smooth feel on your skin inside the dress, but it also teaches a good lesson on how to do such a facing method. Another project I will post about soon ended up needing the knowledge I learned from doing Butterick 6140’s style of facing. It does come in handy to know. I intended on having the bias flounces begin to fall from about mid to high thigh, and take up a little less than half of one side of my dress. Using the bottom bias flounce piece of view D from Simplicity 4138 was an easy solution that gave me everything I had hoped to achieve. I changed up (just a bit) the cutting of the flounce piece. The one edge directed to be placed on the fold to end up with a flounce twice as big. However, the pattern piece was the width and length I needed as it was, so I did not cut it on the fold, but cut two single pieces, still keeping to the grain line as directed. Both flounces were first hemmed in a time-consuming 1/8 hem (like what I did for the sleeves of my 30’s evening gown), then turn under the seam allowance on the other three sides. 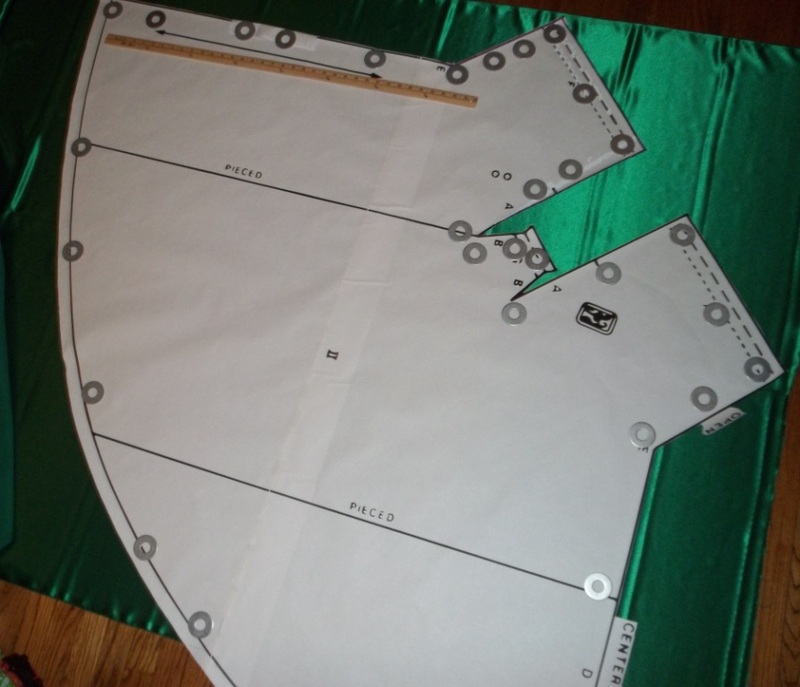 I did a good deal of measuring to make sure the flounces would be evenly placed before sewing them down to the dress’ left side using a double-stitched lapped seam. Hopefully, you can see how the flounce piece looked and how I cut it out in the picture at right. 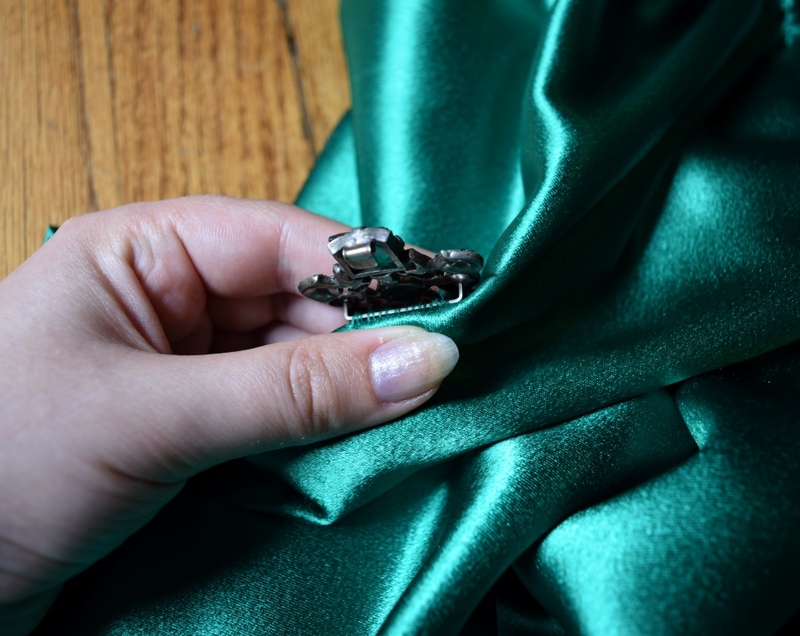 For the hip cinching, I made two small pinches in the satin of my dress on each hip side 1 1/2 inches away from the side seam. 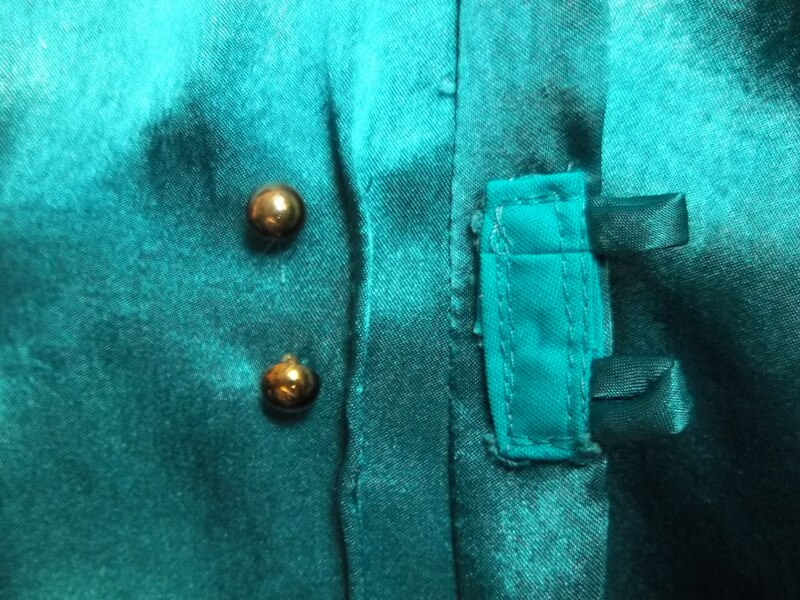 A small one inch piece of turquoise bias tape was sewn to the inside of all four of those pinches. 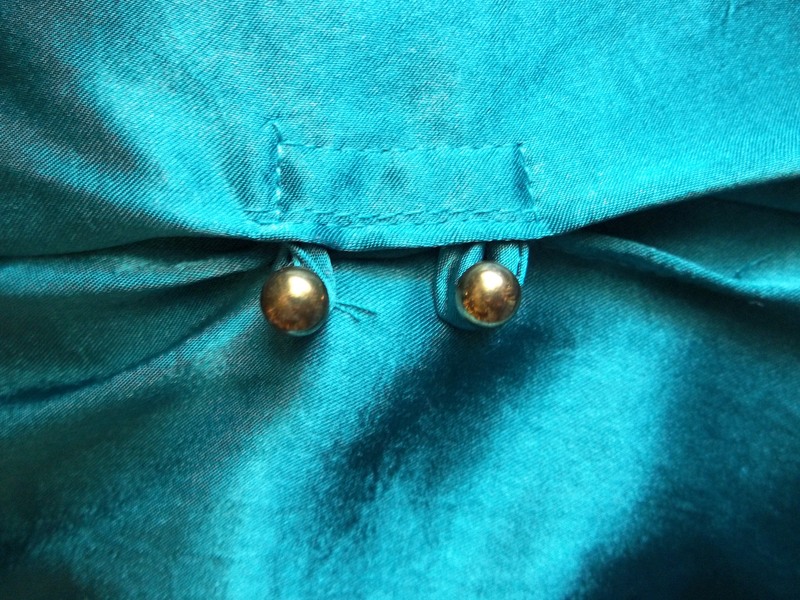 On each side, the forward pinch had the two buttons sewn on, and the back pinch got two self-fabric satin loops slipped under the bias tape piece. I don’t know if this method is historical but it seems practical, simple, and, best of all, it works! I just slip on my dress, then button it in to fit my hips. You can see in the big picture above the hip buttons and the perfect 20’s “bloused” effect they cause. As much as I like the beauty of simplicity, the dress needed the lace neck/shoulder drape to give it that sudden “wow” effect, making it go from nice to elegant. Credit for the drape idea entirely goes to my hubby. 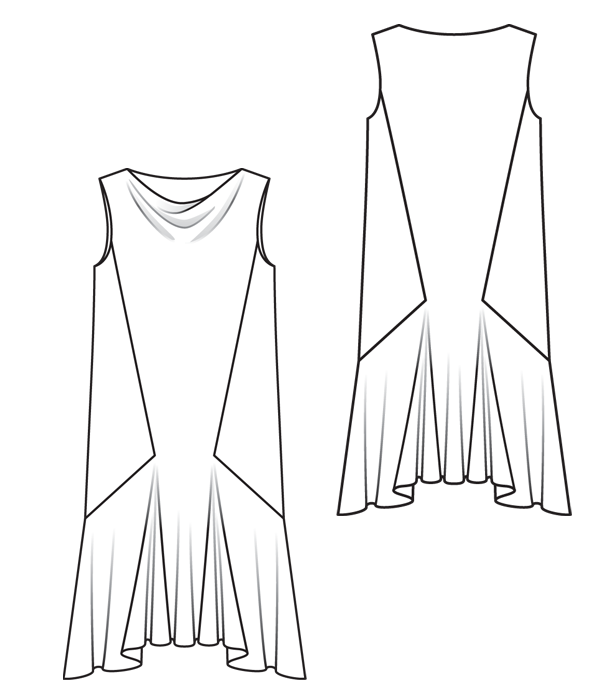 He draped it as you see it on my dress, draped/gathered starting from one side of the V-neck. Although I was skeptical at first, I soon had to admit it looked pretty darn good. To shape the scarf, I took a rectangle of lace fabric, 15 inches by 60 inches, sewed the long raw edges in so it turns into a long ‘tube’. Next, I folded my lace ‘tube’ scarf in half, and half again. 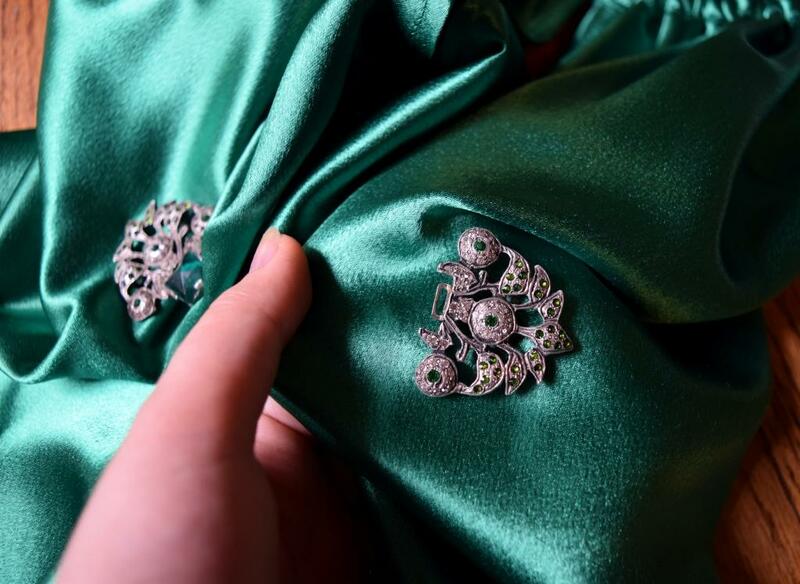 Both shoulders needed self-fabric satin piping tubes to be sewn on them to keep the lace scarf in place around my neck and shoulders (you can see the piping loops in my close-up pictures). 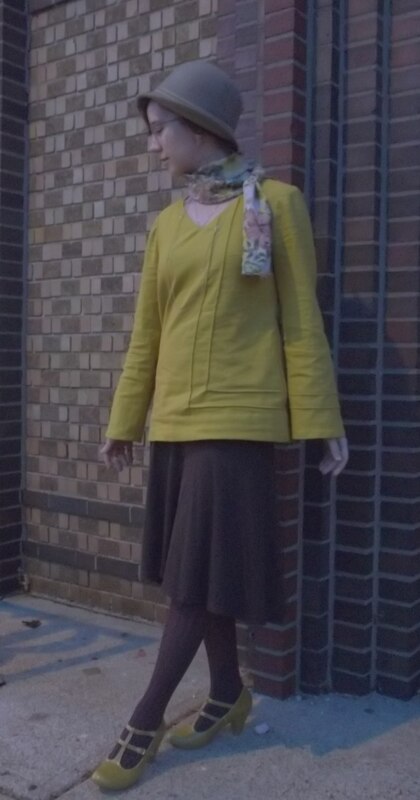 The lace scarf (folded in fourths) was pulled through the shoulder tubing and down the front of my dress, and over horizontally to be tucked under the neck. 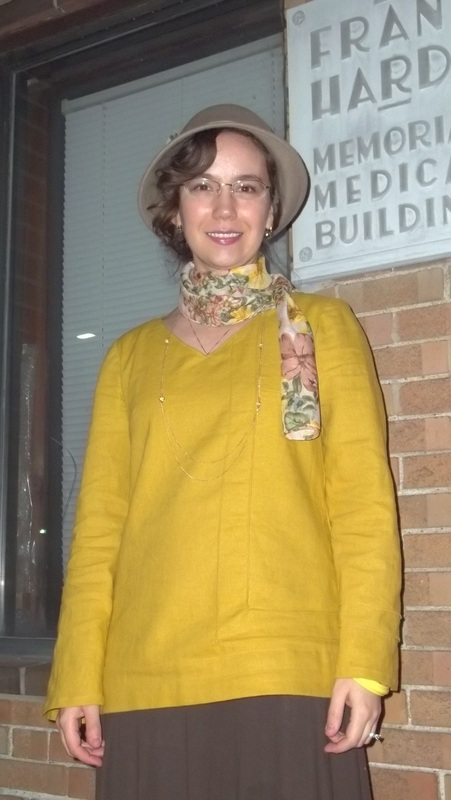 Then the scarf ends were hand-tacked down along the neckline edge from the shoulder to the middle of the V-neck. This process is hard to explain – it just kind of happened and worked out easily without too much fussing. I love how the lace scarf can be worn around my neck or just over the shoulder, for two options on one dress. My dress has already been through a trip through the wash machine, and the good report is the lace scarf held up and is still in place just fine, with the satin being almost wrinkle free. Easy care requirements make this dress even more wonderful. 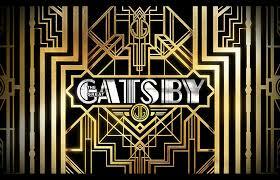 I splurged for the “Speakeasy” party and used my prized Art Deco 1920’s purse for the night. 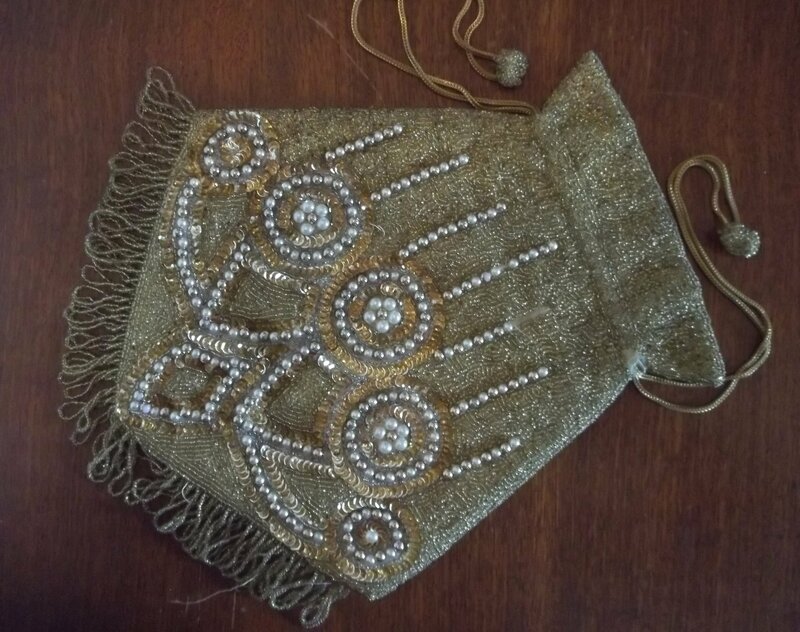 This purse is an amazing work of art – heavily beaded (in both pearls and glass micro-beads), lined in gold silk, with a “Made in Belgium, Saks Fifth Avenue” label. It needs some tender loving care, but I’d rather not ruin its historical authenticity by adding something modern that probably wouldn’t match anyway. To think, I only paid $5.00 for this purse! 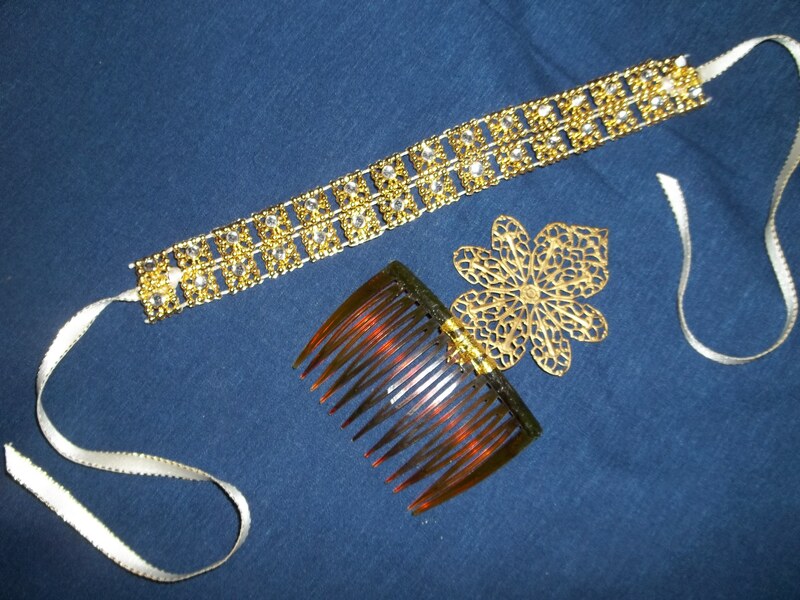 My other personal accessories – my bracelet and my hair comb – were made by me for my outfit. I chose to buy 1/4 of a yard of gold, jeweled, square chain dress trim, cut the length in half, hand-stitched the two pieces side by side, then added on a ribbon piece (from my stash) to each end. Voila! I now have a Deco bracelet that cost me only $1.00. My hair ornament is merely a basic hair comb onto which I whip-stitched a gold filigree metal piece that had been in my stash of beading supplies. The comb gave my hair an authentic and beautiful option to the over-used “head band” look so popular for an easy 20’s up-do. My hair…oh! I was so proud of the tight Marcel waves and spit curls I achieved by only using a small curling iron and some moderate hold hairspray. My earrings (see a close-up in this post) are actually 1930’s vintage, but they have a classic Art Deco styling which matched well with the rest of my outfit. Speaking of matching with my outfit, I’d like to make a point of briefly highlighting how the wall sconce light (in the top left corner of my full shot pictures) is a cool era appropriate touch. 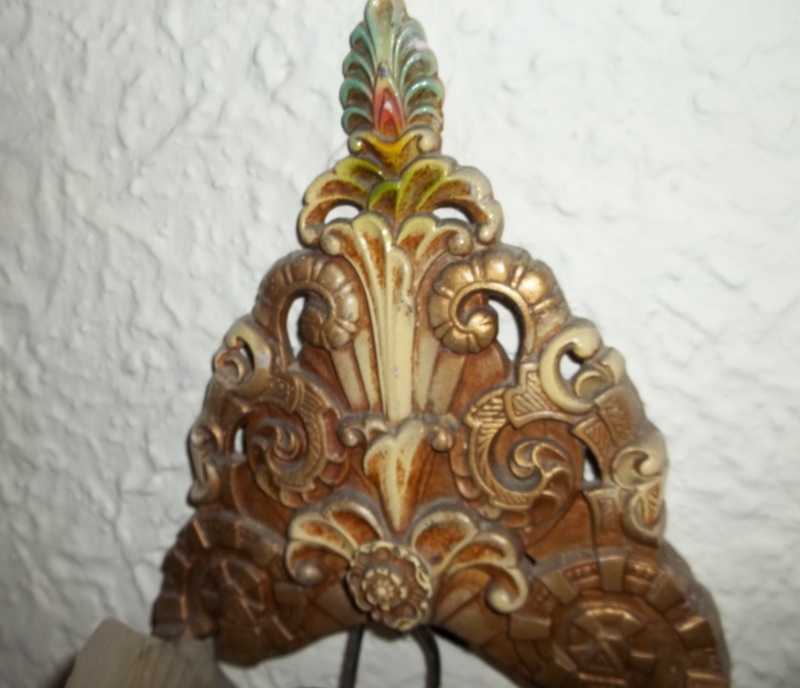 Our house (and neighborhood) was built around 1930 in a style unique to our town, a 20th century Gingerbread version of Tudor revival, with plenty of vitrolite glass and special touches, such as these “bat wing” wall sconces. 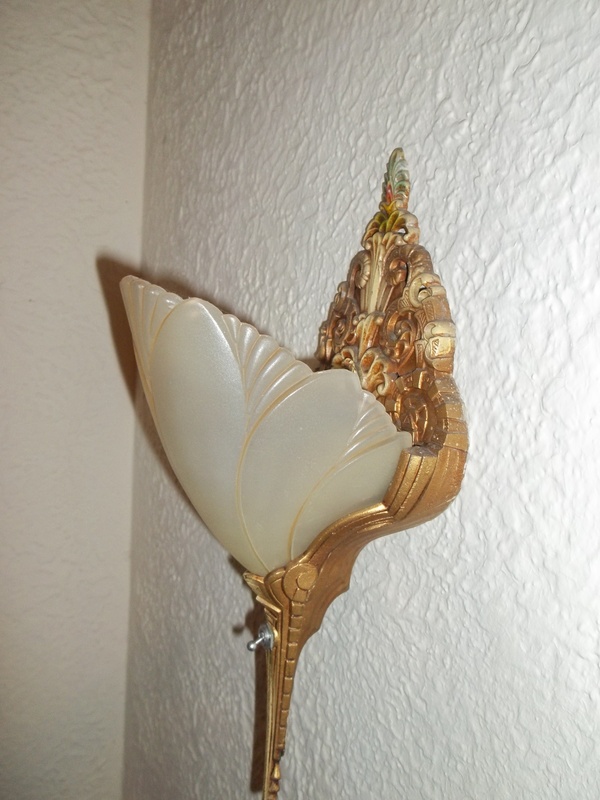 I love how these wall sconces have a slight tinge of pastel colors, with beautiful mix of the swirling, floral theme of Art Nouveau, and a hint of Art Deco . Please check my Flickr page, Seam Racer, for more pictures. 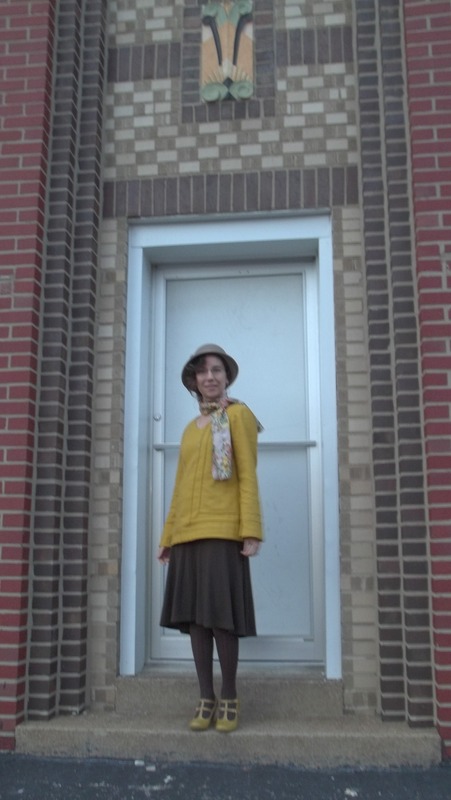 Thanks for joining me in this Prohibition party post!